Print checks and vouchers directly from Brightpearl for payments being made to your vendors. Checks can be printed for batches of payments made against invoices or for one-off checks made via bank payments. All you need to get started is a check template. We've added a standard design, which you can edit millimeter by millimeter to create your own custom templates that will suit your check and voucher layout. You can create multiple templates so you should only need to do this once for each design. Checks can be printed for any purchase payment (PP type transaction) made to a vendor or a bank payment made to a vendor (BP) where it was specified to require a check. Before a check is printed, the payment must be entered. The check number can be entered manually at this stage, but is best left unassigned when using batch printing as this will automatically assign the correct number when it is printed. There is not currently a way to batch pay vendors. Brightpearl supports only base currency bank accounts and payments. Checks and vouchers will always be in your base currency. Checks are always printed in the currency of the payment that was entered. First, ensure that the payments have been recorded against the vendor(s). Go to Accounting > Vendor payments list. Filter the list by bank account and by currency. Select the checkbox next to each payment to be printed. Click the Print Checks button at the top of the list. Starting check number: Enter the first check number that will be printed. Overwrite check numbers: Specify whether any payments which already have a check number should be updated to match the check number sequence being applied by the starting check number. When batch printing checks this should be set to Yes to ensure the correct check numbers are assigned. Template: Select the check template to use. Click the Proceed to print button to preview the documents on screen and send it to the printer. Before a check can be printed you will need to have entered a payment into Brightpearl. The check will always be printed for the payment amount processed and the voucher will always include all the invoices that were marked as paid by that payment. Once a payment has been allocated against the invoices the check can be printed in the usual way, from Vendors > List payments. A check template is used to indicate where each detail should be printed on your check and voucher paper. Every check template starts with a default layout, which can be edited millimeter by millimeter in order to reposition each detail and to move the voucher sections vertically to place them above or below the check. Go to Settings > Templates > Check templates. Enter a name for this template. 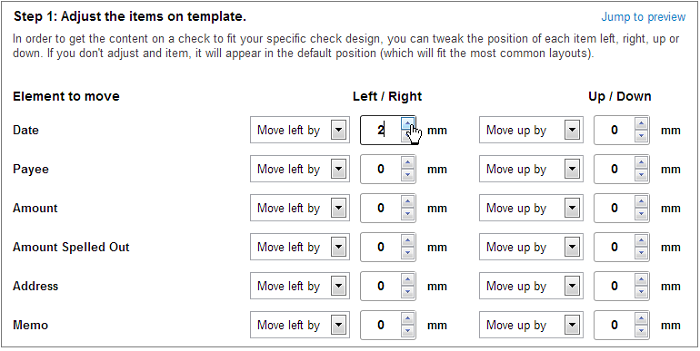 Adjust the check items on the template to move them into the correct position for your check design. Items can be moved a number of mm left or right, and up or down from their current position. 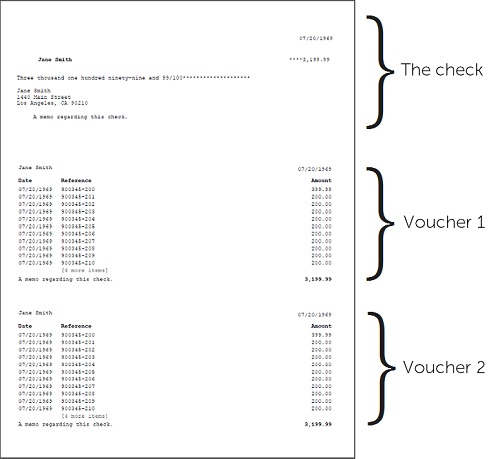 Move the voucher sections vertically to position them above or below the check. In the next section use the fields to move the detail within the vouchers sections. Use the margin adjustment to help fit the template to your printer. Use the preview window to review your changes and print a test page. Before leaving the page ensure that you have saved your changes. Once the payment has been created in Brightpearl the check can be printed and reprinted via Vendors > Vendor payments. If a check was damaged or misprinted and a new check number is needed you will probably also want to update the check number recorded against the payment in Brightpearl to ensure your records are up-to-date. This is done by editing the check number directly on the payment journal. Go to Accounting > Vendor payments. Locate the payment for which the check details need to be amended. Click the journal ID for the payment to view the accounting journal. Make the changes to the check number. Enter a reason for the modification to the journal.